C-SPANSen. Bernie Sanders on Wednesday called for the US to end its support for Saudi Arabia in the Yemen conflict. The Senate on Wednesday advanced a resolution to end US support for the Saudi-led coalition in Yemen. The resolution, which calls on the president to remove most US troops stationed in Yemen, passed 63 to 37. Sen. Bernie Sanders (I-Vermont) led the push for the resolution, alongside Sen. Chris Murphy (D-Connecticut) and Sen. Mike Lee (R-Utah). All Senate Democrats voted in favour of the resolution. Calls for strong action against Saudi Arabia and its leadership have grown louder since the murder of journalist Jamal Khashoggi last month. Wednesday’s vote signals strong bipartisan pushback against the White House over its continued support of its Middle East ally. The resolution, which calls on the president to remove most US troops in Yemen, passed 63 to 37. The resolution failed to pass earlier this year. Sen. Bernie Sanders (I-Vermont) led the push for the measure alongside Sen. Chris Murphy (D-Connecticut) and Sen. Mike Lee (R-Utah). Sanders has long opposed the United States’ role in the war in Yemen – one of the world’s worst humanitarian crises – and characterised it as “unconstitutional” given that Congress had not weighed in on the matter. In an incredible show of unity, all Senate Democrats voted in favour of the resolution. Prominent Senate Republicans, including Bob Corker (R-Tennessee), Lindsey Graham (R-South Carolina), and Rand Paul (R-Kentucky) – all of whom have voiced strong opposition to Trump’s handling of Saudi Arabia in the wake of Jamal Khashoggi’s murder – also voted in favour of the measure. 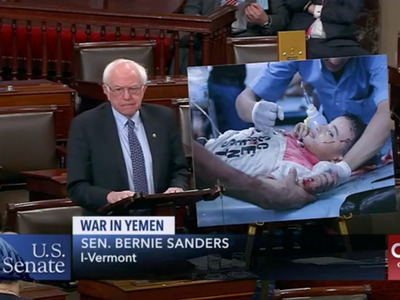 Following the vote, Sanders praised the decision to move toward withdrawing troops from Yemen. Murphy tweeted that Wednesday’s vote sent a huge signal to the Trump administration. The resolution still needs another vote to be debated on the floor, and then a final vote – though the White House has indicated plans to shelve the measure when it reaches the president’s desk. Earlier this month, the CIA determined that Saudi Crown Prince Mohammed bin Salman ordered the assassination despite consistent denials from Riyadh. Bipartisan calls for strong action against Saudi Arabia and its leadership have grown louder since the October 2 killing, and Wednesday’s vote signals strong pushback against the White House over its continued support for its Middle East ally.